Lovely last of the litter. Just sweet bears and I love the banner. Sweet, sweet, sweet! Love the heart banner and your design! Super cute Valentine, Lynn! Pretty papers and textures! I think your first attempt at a banner is fabulous and so prefect for this sweet design! This is adorable. Love your heart banner and your paper choices behind this cute image. Hmm, I don't see what you're seeing, I think it is perfect! Fabulous valentine and an adorable image! Love the hearts! Lynn, this is just perfect for a three yr. old. I think your banner is just darling...no fretting needed. You've used such pretty dp, too. I think it is a winner! I admire your attempt at getting a banner to hang nicely. I think it gets the idea across and is pretty nifty to boot. I like the overall card too. I've finished making Valentine's cards but I still have some to share, but I think you're right. I think folks are getting tired of them. St Patrick's next?! Oh my goodness... this is a precious Valentine card. Love everything about it!!! Gorgeous Lynn, I do love the heart bunting and the bears are so cute. You did such an amazing job with this image. I love the papers, the layout and the embossing. I have to tell you I've never even attempted to make a banner, so congrats to you for even trying. I happen to think you did a super job with it. You did Deedee proud! Have a terrific day. What a sweet image! If I could color, I'd go for this one! Your heart banner caught my eye first thing! I love it! Looks like you know what you're doing and just don't know it. Both of these cards are playful and cute. The first is definitely a boy card. The second could be either. Well in spite of what you struggled with, that banner looks exactly like it should - CUTE! The layered hearts look perfect, and I love those sweet bears and papers too!! Adorable valentine Lynn! Love everything about it! Have to pin it! Lovely card Lynn, and I think the banner is pretty cite! BEAR with you? (Groan! lol!) This is adorable! I love the pierced edge on the bears panel, and I think your banner looks fabulous! I always feel like mine don't 'drape' properly. Awww this is so sweet! I love that image and your beautiful papers, adorable little banner too! This is the sweetest image and you made an adorable card with it. Well I am so used to seeing ur cute creations that I was kind of missing them :) love that hearts banner !! Cute card Lynn and those are fab little bears. Great layout too! What a sweet Valentine...the image is adorable and how cute is that heart banner....love it!!!!! 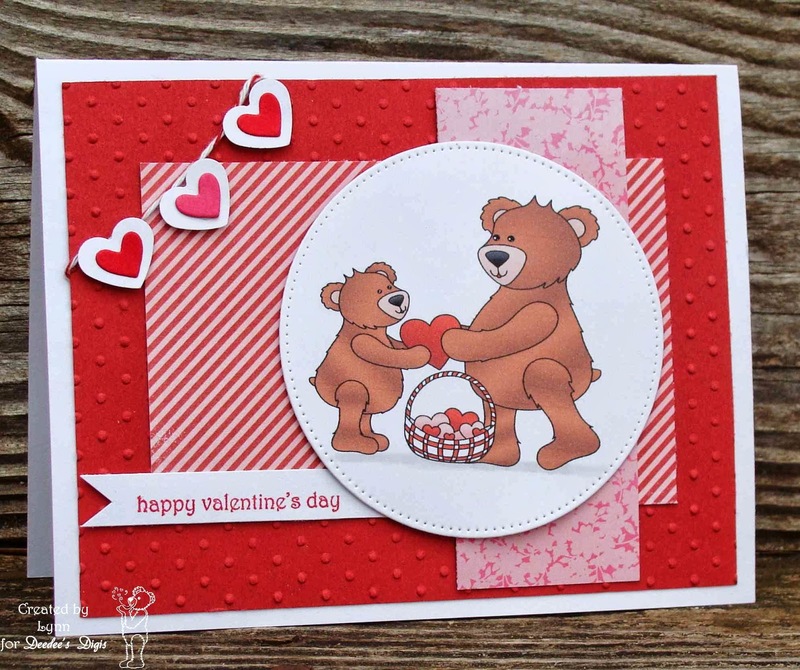 Your bears are too too cute and the hearts are perfect for them! A really wonderful fun card!